Preheat oven to 325 °F. Lightly grease an 8x8 baking dish. 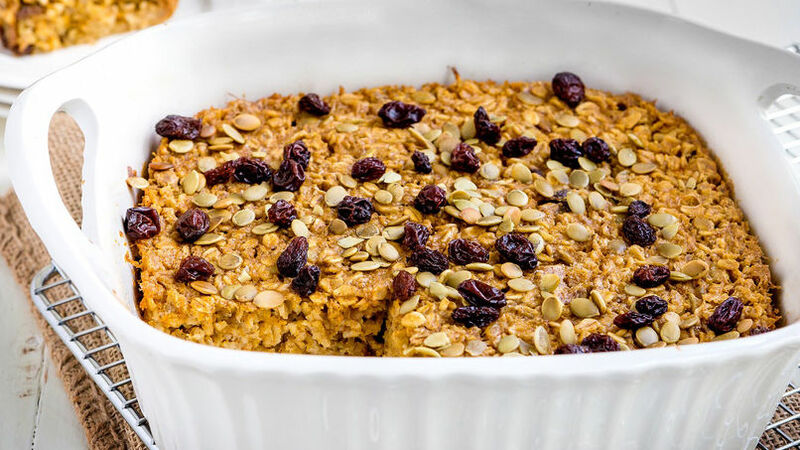 In a medium-size bowl, combine oats, baking powder, salt, pumpkin seeds and raisins. In a separate bowl, combine milk, pumpkin puree, pumpkin spice and sugar. Add wet ingredients to the dry ingredients. Mix until everything is thoroughly combined. Transfer mixture to baking dish. Bake for 50-60 minutes or until the oatmeal is firm and lightly golden. Try adding walnuts or almonds for a complete breakfast. Pumpkin season is finally here! Now is the time when we start to see lots of recipes with pumpkin as the star ingredient. I love this time of year and I enjoy cooking with this ingredient since its versatility allows me to make sweet as well as savory dishes. This recipe is super easy to make and it’s perfect for starting off the day. You can also make it when you have guests over for brunch. Enjoy!